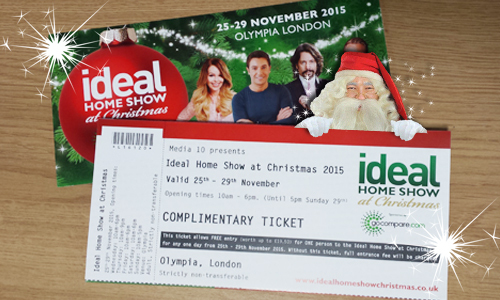 Win tickets to Ideal Home Show at Christmas! We’re looking forward to being part of Ideal Home Show at Christmas in a couple of weeks time – 25th to 29th November at Olympia in London. To celebrate, we’re giving away three pairs of tickets for the day of your choice! This is a great opportunity to discover more about our magical trips and ask any questions you may have. Come visit us at stand D465 – we can’t wait to see you! All you have to do is visit our Facebook page, and like, share and comment on this post – we want you to tell us your favourite thing about Christmas! The competition closes at midnight on Tuesday 17th November. We’ll announce the winners on the morning of Wednesday 18th November. This promotion is in no way sponsored, endorsed or administered by, or associated with, a third party. You are providing your information to Santa’s Lapland and not to a third party. The information you provide will only be used for administering the promotion, contacting winners and subscribing to the Santa’s Lapland newsletter. 1. The promoter is: Santa’s Lapland (Company No. 350786) whose registered office is Mountain House, Station Road, Godalming, Surrey, GU7 1EX. 2. Competitions open only to residents of the UK. 4. No cash alternative to the prizes will be offered. The prizes are not transferable. Prizes are subject to availability and we reserve the right to substitute any prize with another of equivalent value without giving notice. 5. The closing date for entry will be 23:59 on Tuesday 17th November 2015. After this date no further entries to the competition will be permitted. 6. Winners will be chosen by Santa’s Lapland and will be based on those who have “Liked”, “Shared” and commented on the competition Facebook post. 7. Th winners will be notified on Facebook within 12 hours of the closing date. If a winner cannot be contacted or do not claim the prize within 24 hours of notification, we reserve the right to withdraw the prize from the winner and pick a replacement winner. 8. Santa’s Lapland’s decision in respect of all matters to do with the competition will be final and no correspondence will be entered into. 9. Employees of Hotelplan UK are not eligible to enter. 10. Santa’s Lapland does not accept responsibility for lost prizes. 11. Events may occur that render the competition itself or the awarding of the prize impossible due to reasons beyond the control of Santa’s Lapland. Santa’s Lapland reserves the right to change or withdraw the competition and/or prize at any time and the entrant agrees that no liability shall attach to Santa’s Lapland as a result thereof. 12. All costs incurred in travelling to/from the show and other incidental costs incurred on the day are the responsibility of the prize winner, not Santa’s Lapland. When you enter our competition you can be assured that the information you have provided will be used solely by Santa’s Lapland for the purposes of contacting you regarding the competition, for any future competitions and for future holiday and merchandise offers. We will never share your information with, or sell it to, anyone else. Any information you have provided will be used by Santa’s Lapland to contact you regarding this competition, future competitions, holiday and merchandise offers.